Do I really need to say anything about that sandwich?! It was delicious!!! An awesome combination of flavors and a great break from our standard dinner. The girls even ate the egg on theirs (and they are weird about eggs lately). I ate mine on ricecakes and still loved it :-)! Oh, and This recipe is one from Rachael Ray. 1. In a medium bowl, combine the avocado, tomato, onion, cilantro, 1 1/2 tablespoons olive oil and the lime juice; season with salt. 2. In a large nonstick skillet, cook the sausage patties, turning once, for 5 minutes; transfer to a plate. Add the remaining 1/2 tablespoon olive oil to the skillet, then fry the eggs; season with salt and pepper. 3. Divide the avocado salad among the roll bottoms. 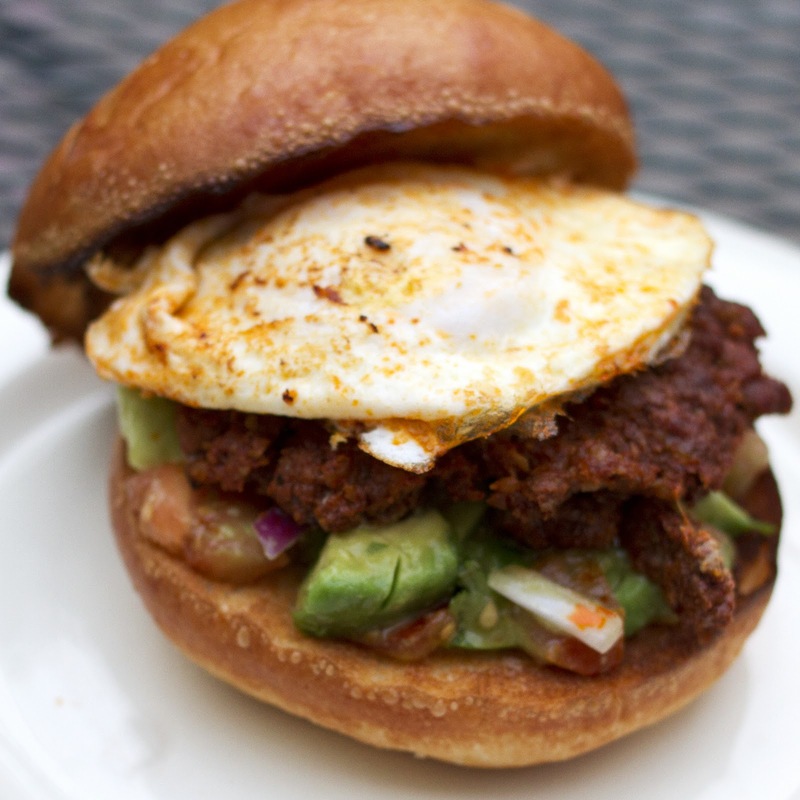 Layer with the sausage patties, fried eggs and the roll tops; serve at once. I went looking on All Recipes for a new salad to make for my girls' night dinner and this is the one I went with. I really liked the dressing and thought it was a great compliment to the rest of our meal! 1. For dressing, in a bowl, whisk together the first six ingredients; set aside. In a heavy skillet, melt sugar over medium heat, stirring constantly. Add walnuts; stir to coat. Remove from the heat. 2. 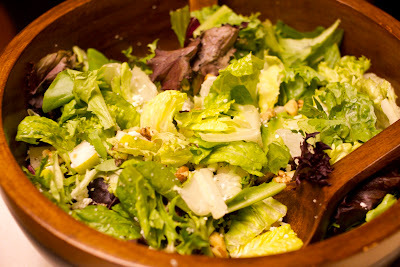 In a large salad bowl, combine greens, pears and cranberries. Drizzle with dressing. Add nuts and blue cheese; toss. This dessert, which I found on Taste Buds, looked too good not to try. 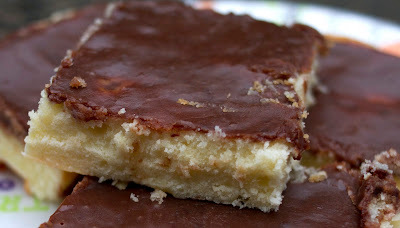 It was absolutely delish...moist and spongy with a great glaze frosting. Not to mention easy enough that I didn't mess it up :-)! In a large mixing bowl, cream the butter, cheese, and sugar for 3 minutes on high speed. Add vanilla then one egg at a time mixing well after each egg. Add flour and mix well. Pour batter into a greased 13 x 18 inch pan. Bake at 325° for 25 minutes or until a toothpick comes out clean. Frost immediately with glaze. So, when it came time to figure out what to do with my ham for my girls' night dinner I went to Hormel's website first and when I saw this I thought it sounded absolutely delish! I think this sauce got more rave reviews that night than anything else and it was seriously so easy!!! 2. In ovenproof skillet, melt butter over medium-high heat. Add ham; brown lightly on both sides. 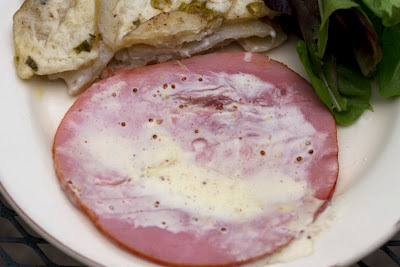 Remove ham to plate. 3. Add cream to skillet; whisk to release any browned bits from bottom of skillet. Whisk in mustard. Return ham to skillet. Bring to a boil. 4. Bake 20 minutes. 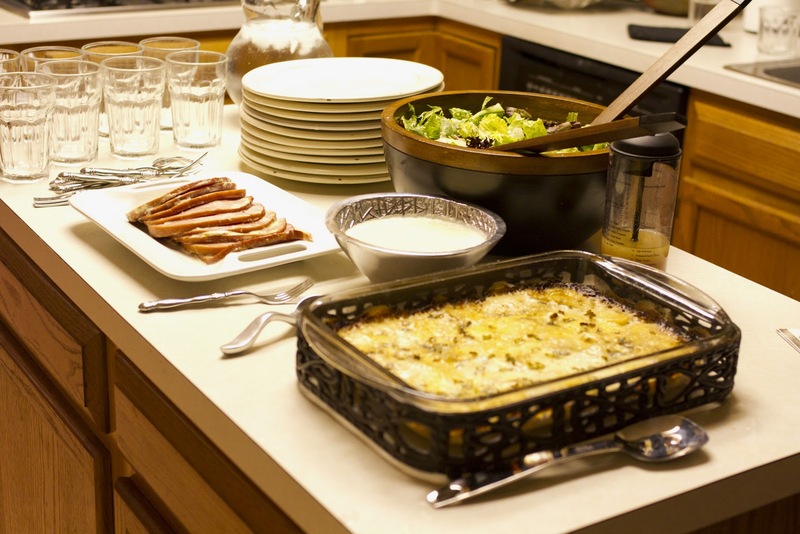 If cream does not thicken, return to stove and gently boil 5 minutes or until thickened. This weekend I hosted a girls' night out dinner. Through Foodbuzz and Hormel I was given the opportunity to try out Hormel's new Cure 81 Ham and it was the perfect excuse to throw a little party. I had never cooked ham in my life, so I was a little nervous, but since the Cure 81 ham was already cooked it was super easy. I even found some of my recipes right off Hormel's website! Who knew :-)? 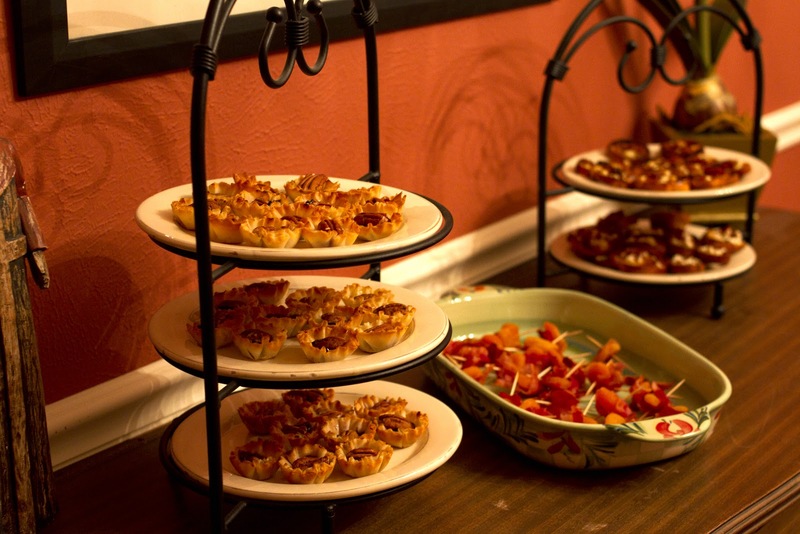 Here is the menu I planned, followed by the appetizer recipes (and the rest to come soon). 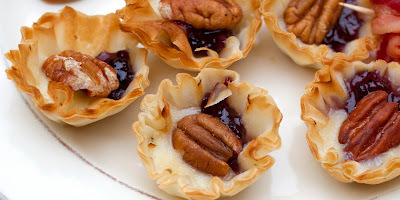 Fill each mini fillo cup (found in freezer section) with a tiny cube of brie, a spoonful of blueberry fruit spread (I used a baby spoon), and top with a pecan half. 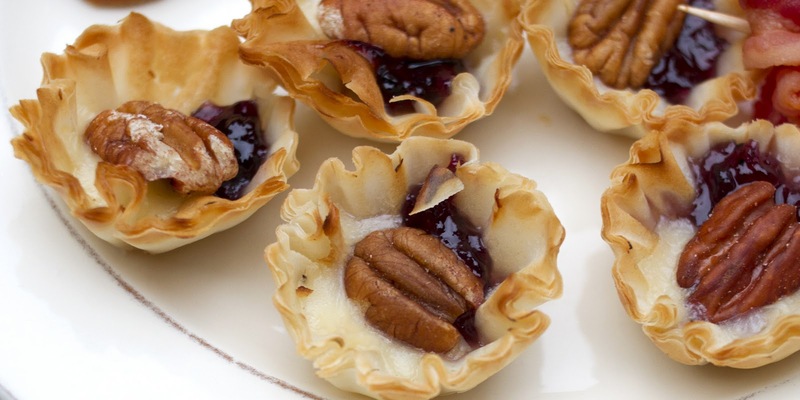 Bake in 400 degree oven for 10 minutes or until cheese has softened and pecan is toasted. Serve warm or at room temperature. 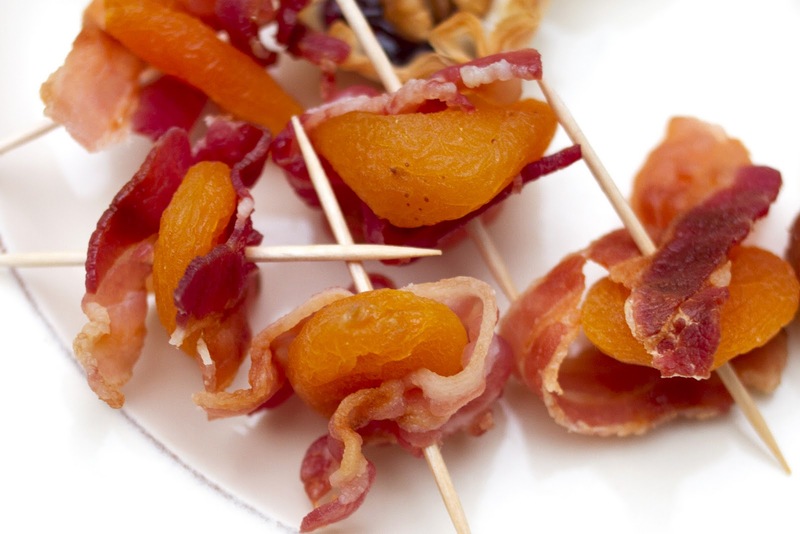 Wrap dried apricot halves with cooked bacon slices and secure with a toothpick. This is usually done with prunes but the texture of the apricots in this dish is fantastic. 1. Heat broiler to 500ºF. 2. 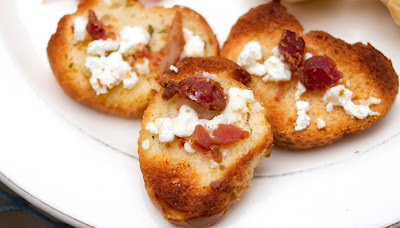 Top each crostini with 1 teaspoon cheese and generous pinch bacon; place on baking sheet. Broil 6 inches from heat source 5 minutes or until cheese is slightly browned and bacon is hot.